For some reason my mom and dad are having a mini-reunion with me in North Carolina (in waking life they divorced when I was little). I imagine a picturesque image of my dad wrapping his arms around my mom. I'm stressed out because I brought all my music gear here and it's started to rain so much that it floods. My amplifier is submerged and floating in the water along with my bag of cords and adapters. I cat-crawl along the ledge over the water reaching out to my stuff and attempting to pull it out on the shore break to dry, but it's futile. Later, my dad and I are waiting on my mom to show up. He's being evasive when I ask, "Where is mom?" His attitude is self-absorbed while my mom is flustered with something. It's exceptionally cooler and rainy out – refreshing. Wearing pants today. Janice, the boss's daughter who's 6 years old, sits at the table with nothing to do wearing her Donald Duck pajamas. She complains about it being cold so I retrieve the beach towel from my car. It has a Checkers grid woven into it so I teach her how to play the game using soy sauce and duck sauce packets. Lentil Wrap with Hummus and Tomato. Salt n Vinegar Chips. Honey Oolong Tea. I'm solo today, like absolutely solo – the only driver for the restaurant. I'm obligated to be superman. Snacking on Cadbury Milk Chocolate. At some point during the nighttime orders I feel the pangs of the mundane – this job – opening and shutting the driver's side door a thousand times – knocking on door after door – saying the cordial "Have a good night" for every customer – walk into the restaurant, grab an order, deliver it, come back, repeat. I start to feel like a delivery driver zombie. Sipping on a Rolling Rock and eating Fried Shrimp with Broccoli, Onions, Carrots, and Rice in Garlic Sauce. Ana drops in for a little while. Me: "I just noticed you have a diamond shaped face." Embarrassed she says, "That's because I just cut my bangs." 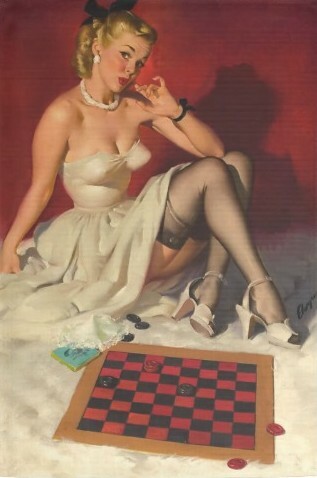 [i] Checkers Pinup Girl Towel. Source unknown.